Spring has sprung in San Diego! With the warmer weather finally here, you may start to notice big bunches of bees in your neighborhood. Since we are entering swarm season, we thought we’d talk a little about the difference between a swarm and a colony and what to do if you encounter either of these bee formations. Swarms are actually an integral part of the bee reproductive cycle. They look like big clusters of bees flying close together because that’s what they are! Usually in the springtime, the queen and about half of the worker bees leave their hive behind in search of a new one. While the scout bees look for prime bee real estate, the rest of the bees swarm together in wait. You will typically see swarms in trees or bushes, or even on mailboxes and fences. Swarms can stick around for just a few hours, or even a few weeks. Bee swarms have nothing to protect while they are looking for a new nest location – no honey, brood or beeswax. Because of this, they are usually very docile and unlikely to sting unless disturbed. A colony is when a bunch of bees – sometimes up to 50,000 – are living happily in their hive. After the scout bees find a suitable site for their new nest, the swarm moves in and begins to set up shop. They build comb to store honey and pollen and house the larvae and the pupa. Bee colonies can be located anywhere, including in places we don’t want them, like the walls of our home or other structures. Because the bees now have something to defend, they may be a little more aggressive and could potentially sting if they feel that their hive is being threatened. What should I do when I encounter a swarm or a colony? A large number of bees clustered together can be unnerving and downright scary! But because of how important bees are to our ecosystem, it is important to know what to do if you happen to encounter a large swarm or bee colony. Swarms might look dangerous, but they are generally pretty easygoing. After all, they do not have a home, honey or baby bees to protect. 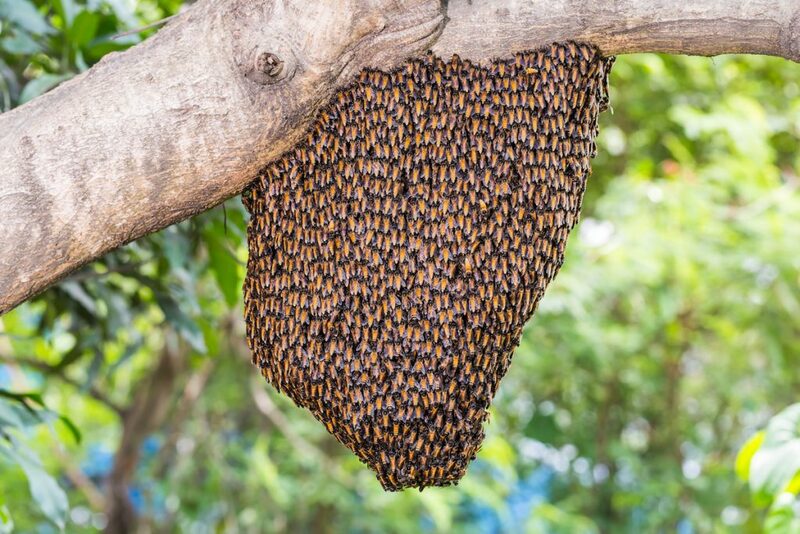 If you do see a swarm on your property, just be patient. They will be on their way in a few hours or a few weeks. Do not attempt to move them on your own or spray them with any chemicals. If they sense a threat, they may still sting. If the bees are in a location that is potentially dangerous, call D-Tek Live Bee removal for help safely relocate the swarm. Colonies are a slightly different story. If you have a bee colony that has shacked up in your wall, chimney, attic, shed or another area that is potentially unsafe, do not attempt to spray them or remove them yourself. They can become aggressive when they sense a threat. The best course of action is to call a professional live bee removal expert to assess the hive and help you determine the best remedy. D-Tek Live Bee Removal not only removes and rehomes the bees, but they are experts at repairing damage from the removal of the hive. Any good bee removal company will also be sure to remove the remaining beeswax to deter bees from coming back or attracting rodents. Whether you have a swarm or a colony, D-Tek Live Bee Removal is your trusted source for humane live bee removal. Our experts can remove your bees and rehome them with a local beekeeper so you know that you are doing your part to keep bees safe. Contact D-Tek Live Bee Removal when you need bee removal, bee repairs or bee proofing at your San Diego home or business. Our team is ready to help you figure out the best solution for your bee problem! Don’t wait and call D-Tek Live Bee Removal today.